Last week was a disjointed week, with two of our top three teams on byes and three games played on Thanksgiving Thursday. 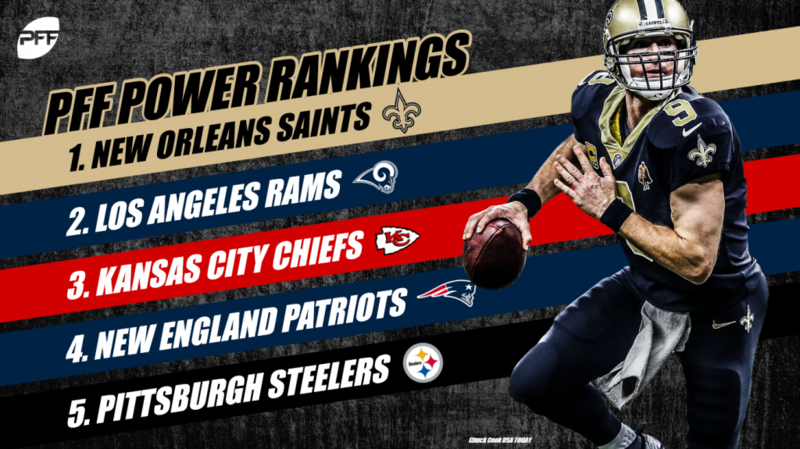 The Saints continued to show why they are the top-ranked team in our ranking system with an impressive win over a division rival. Pittsburgh, Cincinnati and Tennessee saw the biggest drops in their ELO Ratings while Cleveland, Denver and Houston saw significant upticks after impressive victories in week 12. New Orleans has emerged as (in our opinion) the clear Super Bowl favorite, with an almost 29% chance to win their second world title. Drew Brees and the offense continues to hum, this week throwing four touchdowns to undrafted players in a rout of the Atlanta Falcons. Brees is generating over 0.30 expected points added per dropback, while his support is turning every air yard into over 1.2 actual passing yards and allowing pressure at the lowest rate in the NFL. While they will need to hold off the Rams to make their Super Bowl bid more likely, the tiebreaker they earned just a few weeks ago remains one of the bigger wins of the NFL season. Coming off of a bye with a 10-1 record, the Rams face an interesting road for the rest of the year. They have the sixth-easiest schedule (versus 11th for New Orleans), meaning that home-field advantage tacked onto their likely first-round bye remains a distinct possibility. They are one of less than a handful of teams that are generating positive expected points through the air and on the ground on early downs, and that is a balance that will likely travel with them throughout January. In observing the Chiefs’ season so far, I’ve become more confident that they can represent the AFC in, and possibly win, the Super Bowl more in their losses than in any of their wins. Patrick Mahomes eclipsed the 3.0% turnover-worthy play percentage after the loss in Los Angeles last Monday night, showing that even an offense as powerful as the Chiefs can a) score 50 even while making mistakes b) can make losing mistakes. As Mahomes and the Chiefs face the 24th-toughest schedule moving forward and Mahomes starts to reach the teens in starts, look for a reduction in turnovers to be a focus and an ending to high-profile games to change in the Chiefs favor as a result. Sunday was a ho-hum, double-digit cover for the Pats in New York in which Tom Brady continued to have (for him) what amounts to a middle-of-the-pack season. His negatively-graded throw rate is 13.5% on the season, higher than the likes of Blake Bortles, Derek Carr, Alex Smith, Marcus Mariota and others, and this is the most-stable statistic for a quarterback. His rate of positively-graded throws (a bit less stable) is down to 26.1%, showing a diversion from the 29.6/12.1 ratio last year. He’ll face a tough test this week against the Vikings but needs to win to keep pace in the upper echelon of the AFC. A comedy of errors cost the Steelers a game last week against the Broncos, making their Sunday night game against the Chargers one of the more compelling and important games in the AFC this season. Big Ben continues to struggle with turnover-worthy plays, generating one on every 3.4% of throws. His big-time throw rate is among the league’s best at over 6%, so if you’re a Steelers fan, there is some hope that the offense can take off once he (and the brilliant coaching of Randy Fichtner) fully realize their potential over the next month. 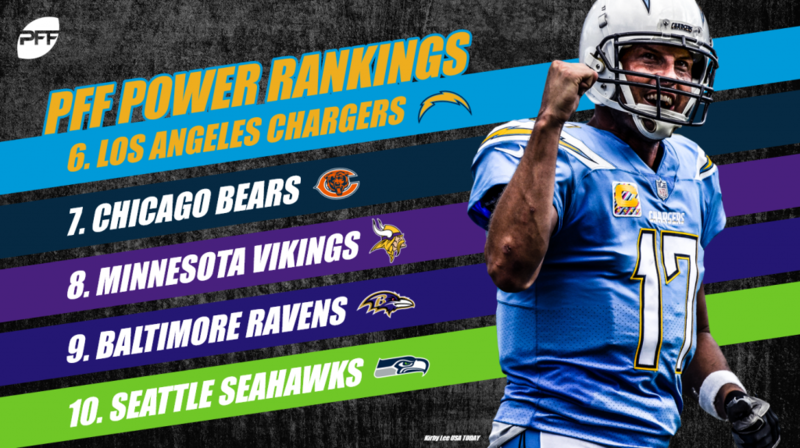 The Chargers are an impressive 8-3, with two of their losses against the mighty Chiefs and the Rams. Despite this, their opponent’s average PFFELO rating is the league’s second-worst (only the Bears have played an easier schedule to this point). Taking advantage of this slate, only the Saints have a higher EPA on early-down passes than the Chargers, and no team in the NFC has given up fewer than the -0.08 EPA on early-down passing plays defensively. While they have an uphill (10% chance) to win the AFC West, if their fundamentals maintain against tougher opponents, this team could make some noise come January. As stated above, no team has faced an easier schedule to this point than the Bears. However, no team in the NFC has been as suffocating on early-down passes than the Bears, allowing -0.07 EPA. Assuming Mitchell Trubisky returns to health and improves as he has over the last month, the Bears offense (third in the NFC in early-down passing) could be enough to compete with all but the Rams and the Saints come playoff time. Enigmatic as ever, the Vikings handled Green Bay last week on the back of a suffocating defense that has survived an early-season struggle against teams like the Rams and Saints. Four sacks, one hit and 11 hurries, along with just four missed tackles helped them keep their NFC North rival to under 20 points for the third time in three tries at US Bank Stadium. Their road to the NFC playoffs is probable (over 80%), but a difficult schedule including the Patriots, Seahawks and the Bears will certainly test the purple. Left for dead a few weeks ago, the Ravens have come out of the bye with their new quarterback 2-0, and are now in the thick of the race for the AFC Playoffs. Lamar Jackson’s 188 rushing yards the last two weeks, along with the 233 from Gus Edwards, are an excellent example of how important quarterback rushing yards are and how interchangeable the running back position is at the NFL level. The Ravens have a top-10 most-difficult schedule coming up, whereas teams like the Colts are in the bottom 10, so the battle is uphill for the birds. Also left for dead, this time before the season started, the Seahawks had a signature win last week on the road against a team that they were competing with for an NFC playoff spot. Russell Wilson continues to do Russell Wilson things, generating big-time throws on over eight percent of his dropbacks (tops in the NFL). Their defense has struggled to stop the run on early downs (+0.02 EPA allowed), and they are only in the middle of the pack defensively stopping the pass, but with the fifth-easiest schedule coming up (including two games with SF and one with ARZ), it’s becoming more and more likely that we’re going to see Seattle in the NFC playoffs after a one-year hiatus. While it’s likely not going to be pretty on Thursday, there’s more than a 50% chance that the Cowboys will be sitting at 6-6 and in a three-way tie for first in the NFC East come the end of the weekend. 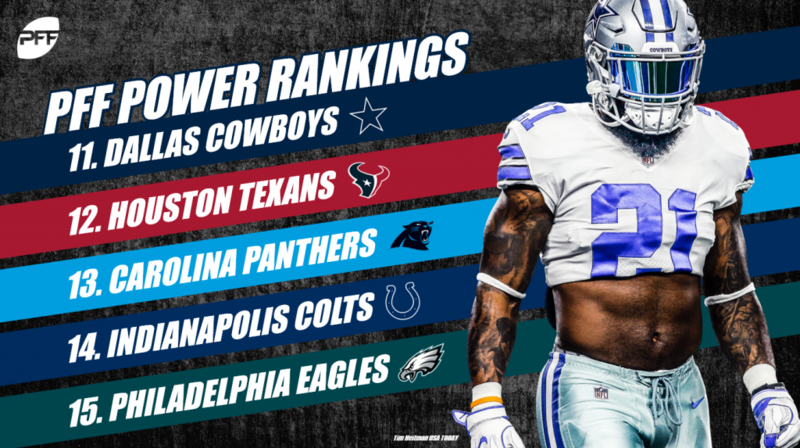 All told, this is not a terrible state for the club, as they have had to climb out of an early-season hole induced by inconsistent play from Dak Prescott and an injured offensive line. In just over 200 snaps for the Cowboys, Amari Cooper has turned 29 targets into 349 yards, a needed injection of explosiveness to a team with one of the league’s fiercest defenses. Eight-consecutive wins have given the Texans some breathing room in the AFC South. Deshaun Watson has been extremely explosive when he has taken care of the football, generating positively-graded plays on over 30% of his dropbacks so far this year. Their defense has battled injuries and improved since their 0-3 start, becoming one of two AFC teams to allow negative EPA on early-down passes. While they are likely to have difficulties in the AFC playoffs, their relatively-easy road down the stretch might allow them to backdoor into a bye, making anything in January possible. 6-2 might have elicited unwarranted expectations for the Panthers, given that they needed two improbable comebacks just to beat the Eagles and the Giants. Regression has hit, and now at 6-5, they are on the outside looking in for an NFC playoff spot. 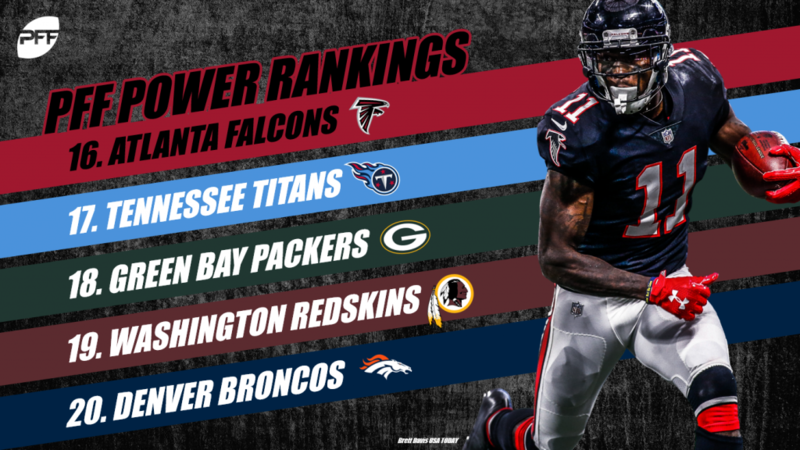 With three games against the Saints and the Falcons to close the season, and a defense in the bottom four in the league in early-down passing allowed, 9-7 might be the high water mark for this Carolina group – a record that would likely keep them out of the playoffs and induce some change in the offseason. Sunday was a great example of where the market data can sometimes leave us with a different opinion than what is actually the case. While they didn’t cover the touchdown-plus that they were favored by, the Colts impressed by coming back from double digits to earn a victory – their fifth in five games. Andrew Luck is generating a positively-graded throw on over 28 percent of his dropbacks while limiting his turnover-worthy plays – something that has plagued him in the past – to under four percent. 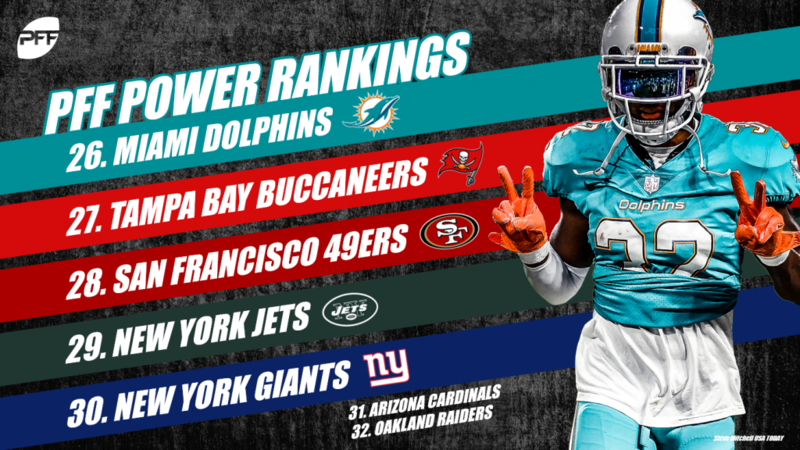 They are a dangerous team – and while the numbers might not stack in their favor to win a division this year – they are deeply in the thick of it for an AFC playoff berth. Coming back from a 19-3 deficit at home against the Giants shows… something. I’m not exactly sure it shows that the Eagles are for real moving forward, but what can’t be denied is how the schedule lines up for them in the short term; beat Washington at home Monday night and you’re tied for first place in the NFC East. Variance (under pressure stats, fourth down conversions, third-down passing) all went the Eagles’ way last year on their way to the Super Bowl. If that comes back this season, a year in which Carson Wentz (only 10.2% negatively-graded throw rate) is playing very well, the Eagles could still be in the conversation come January. The Tennessee Titans got doubled up on Monday Night Football to a division rival they had to beat if they wanted a shot at the division crown. At 5-6, their playoff odds have dropped considerably and currently sit at 14%. Marcus Mariota continues to struggle and has a higher percentage of turnover-worthy throws compared to big-time throws. On early down pass attempts, they have generated a mere 0.02 EPA per dropback which has forced too many third and longs that they are simply not able to overcome. How did we get here? With one of the most talented quarterbacks in the NFL and a gifted set of skill position players, the Packers are currently projected to win seven games and have only a 7% chance at getting into the playoffs. It seems like the Packers have squandered another year of Aaron Rodgers‘ prime. The play calling continues to be bad in the most crucial of spots, and most assume that Mike McCarthy is on his way out after this disaster of a season. After a tough loss on Thanksgiving in a game that saw numerous defensive breakdowns, the Redskins find themselves on the outside looking in at the NFC East division race. Our model has them as a 34% chance of winning the division with the 21st-toughest schedule remaining. Their defense will have to return to form if they want to sneak into the playoffs with Colt McCoy at quarterback. The Broncos rode some mistakes to victory at Mile High stadium. Defensively, they continue to be stifling against the run and have allowed a successful rush on only 38% of early down attempts. With an expected win total of 7.5 games, the Broncos are in a bit of purgatory with some talent on the roster, but significant questions remain over the team’s quarterback. What they do in the offseason will go a long way towards determining if they can return to the playoffs in 2019. The Browns had the biggest jump in our PFFELO rankings from week 12 to week 13. Baker Mayfield had his best NFL game from an EPA standpoint, throwing for four touchdowns in a convincing win over the division rival Bengals. Mayfield has a big-time throw on 6.4% of dropbacks, which puts him in the same vicinity as the elite NFL quarterbacks. 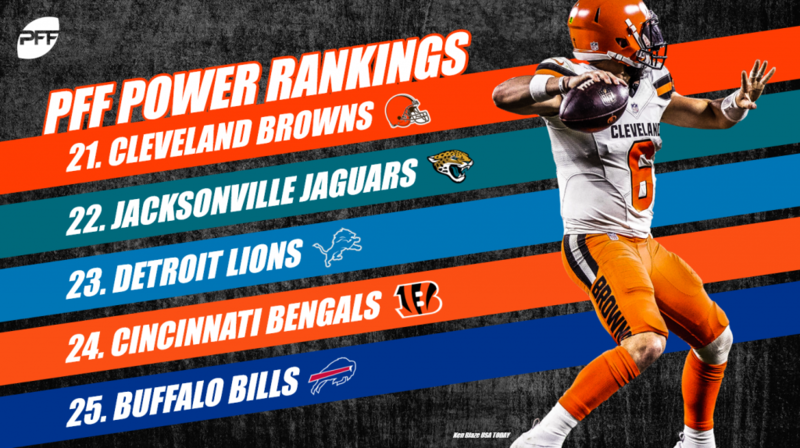 Although out of the playoff picture in 2018, with the young talent this team has on both sides of the ball, the Browns should be a preferred destination for head coaching talent. How unstable is defensive performance year over year? Incredibly unstable – and the 2018 Jacksonville Jaguars are a shining example as to the futility of relying on the defense to win championships. After losing to the Bills, the Jaguars find themselves at 3-8 and on the verge of another top-five pick. With Leonard Fournette unable to stay on the field and T.J. Yeldon an unrestricted free agent, who is to say the Jaguars don’t waste another high-end draft pick on a generational talent at running back. The Lions dropped their marquee Thanksgiving matchup at home to a backup quarterback. The team is in disarray, and there is already talk swirling about Matt Patricia being a one and done head coach. Matthew Stafford has struggled to face the blitz in 2018, dropping almost 30 points from his career-high passer rating when the defense sends an extra rusher. Kenny Golladay, the one healthy receiver left, is emerging into one of the best young pass-catchers in the NFL. In 2018, he has an aDOT of 11.4 and caught 63% of his contested passes, while generating 0.63 EPA per target. With Andy Dalton now on IR, the Bengals’ season has turned into a disaster in a hurry. Before this past week’s loss against the Browns, we had the Bengals with a 20% chance at making the playoffs, but after week 12 they are sitting at only a 4% chance. With their top offensive players now lost for the season, it will be tough for them to even realize their seven expected wins. Our model currently has them at even, though they have one of the easiest remaining schedules in the league. Josh Allen – the man, the myth, the legend – had his best passing grade of 2018, knocking off the Jaguars in the process and securing the Bills’ fourth victory in 2018. Allen has definitely flashed at points in 2018 with 5.0% of attempts grading out as a big-time throw, but his 64.1% accuracy percentage is by far the worst mark in the NFL. Everything said about Allen’s pre-draft analysis seems to be correct, but if he can improve his accuracy and limit bad throws, he can be successful in the NFL. The Dolphins gave the Colts an inspired game of football, but couldn’t hold off Andrew Luck late and eventually fell as time expired with Adam Vinatieri nailing a game-winning field goal. Ryan Tannehill returned and will try to show why he should still be considered the quarterback of the future for the Dolphins. If his performance doesn’t improve over his early season play the Dolphins should strongly consider moving on from Tannehill. In 2018, he has the highest percentage of turnover-worthy throws in the NFL. Jameis Winston had his best offensive game of 2018 in a blowout win over the 49ers. He now leads the league in aDOT by a wide margin but has struggled on deep throws, posting a passer rating of 60.4. His turnover-worthy throw percentage of 6.7% is the second-highest mark in the NFL among active starting quarterbacks. He is playing for his future employment in the coming weeks and will continue to flash big-play potential along with costly mistakes mixed in. The 49ers had a disastrous weekend before even stepping foot on the field on Sunday and played an uninspired game losing badly to the Bucs. The 49ers quickly cut ties with Reuben Foster and are simply riding out these last few contests in a lost season. Kyle Shanahan will continue to put his players in ideal spots, but with a roster devoid of top-end talent, he is hamstrung by injuries in critical positions. If the 49ers have a productive offseason, they will be a prime candidate for a rebound season in 2019. Things have really taken a turn for the worse for the Jets. Sam Darnold didn’t exactly set the league on fire before going down with an injury, posting the second-worst EPA generated per dropback along with the third-highest percentage of turnover-worthy throws. This offseason will be spent putting playmakers around Darnold. The Giants took their division rival Eagles down to the wire but eventually lost after leading into the fourth quarter. Eli Manning has targeted the running back position at by far the highest rate of his career and has been rewarded with Saquon Barkley averaging 7.5 yards after the catch per attempt. The only other bright spot for Eli has been his play when blitzed, as he has posted a passer rating of 113.2 against the blitz, sixth-best in the NFL. The worst case scenario is Eli Manning playing well enough down the stretch to convince the Giants’ brass on rolling the dice with him for one more year. Josh Rosen has struggled immensely in his rookie campaign posting the worst EPA per dropback of any quarterback in the league at -0.31, however, he has actually seen a significant improvement in EPA generated since Byron Leftwich took over play-calling responsibilities. This, along with his high percentage of big-time throws, is cause for optimism in a season that has otherwise looked like a disaster. He has definitely flashed at points and needs to show steady improvement on his decision making over the final weeks of 2018. The Raiders sunk back down to reality, getting doubled up on the road against Baltimore. Derek Carr simply isn’t the solution at quarterback for the Raiders. He has been atrocious when relied upon to make plays, generating -0.06 EPA per dropback. Although they aren’t currently projected to receive the first overall pick of the 2019 NFL Draft, as long as they stay ahead of quarterback-needy teams, they should be able to have their pick of signal-callers in April.